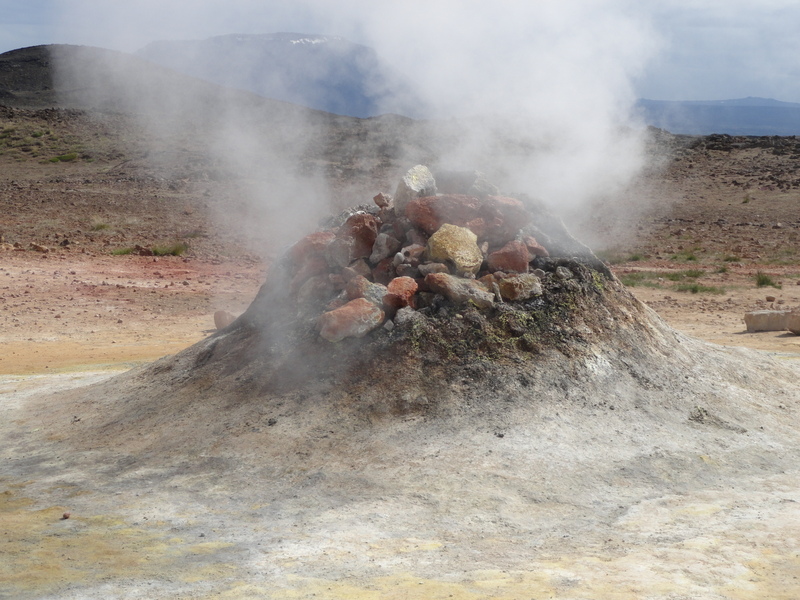 Upon exiting the bus, the air reeked of rotten eggs and that’s when the experience of the land of fire, mudpots, volcanoes and stream began. 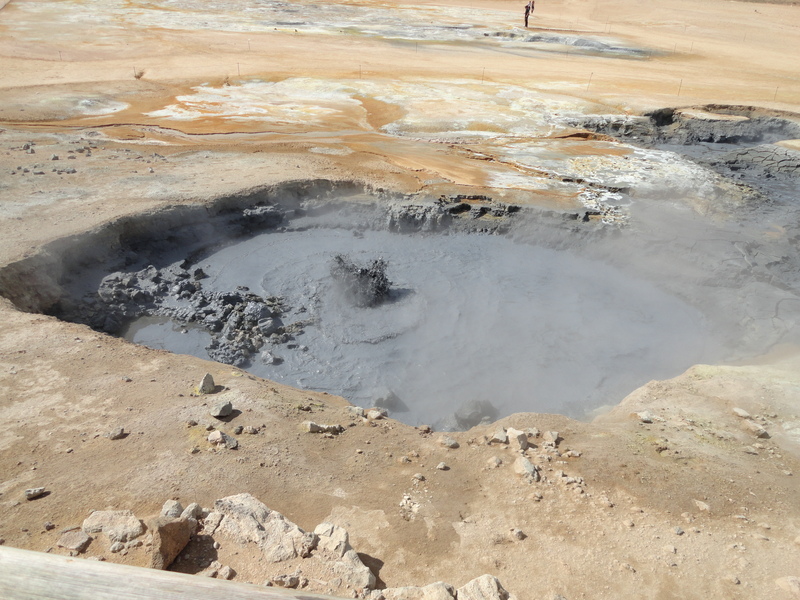 As walking continued to observe several huge holes in the white and orange ground, boiling and steaming liquid black mud made the experience vividly real. That’s when it was time to be cautious and careful where the feet landed having just been told “it only takes 5 minutes to boil a tourist.” Becoming a participant in the boiling mud pot was not on the bucket list. So staying on the dedicated path was mandatory. 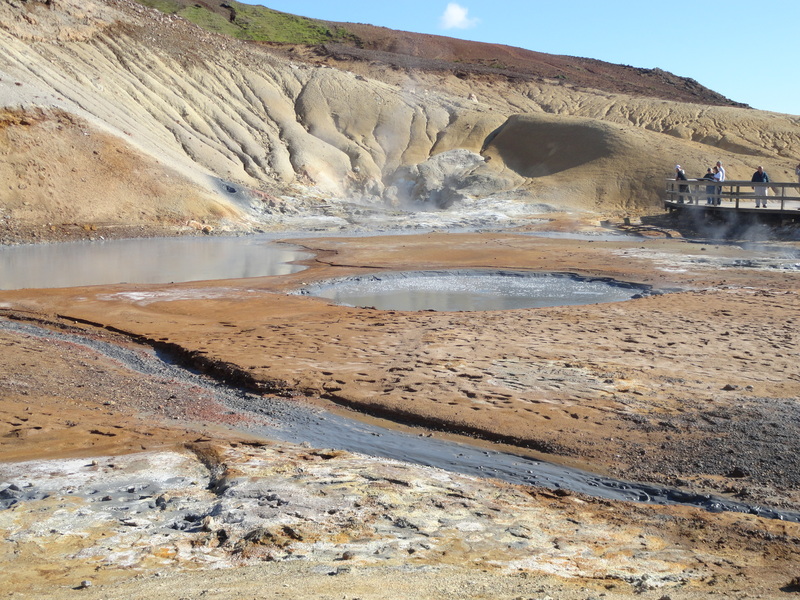 Seeing the fumaroles, mud pots and steam vents in Krysuvik-Seltun and Namafjall Hverir Parks in Iceland was a powerful event to be experienced and remembered as long as the brain works. Seeing a plain hole in the black dirt next to the dedicated path that had the diameter of a golf ball was nothing extraordinary. That was until the sound of an egg frying in a pan flowed out of the hole. Through that little vent hole, energy from the interior of the earth was releasing built-up steam. But that little insignificant hole was not to be out done by a 4-foot by 5-feet in diameter conical pile of rocks just steaming and smoking a solid stream non-stop. And while it was steaming, it produced a sizzling sound as loud as 10 welding torches blowing at the same time. water-boiling pots performed non-stop, releasing sulfur-smelling steam and loud sizzling noises for all to see and hear. 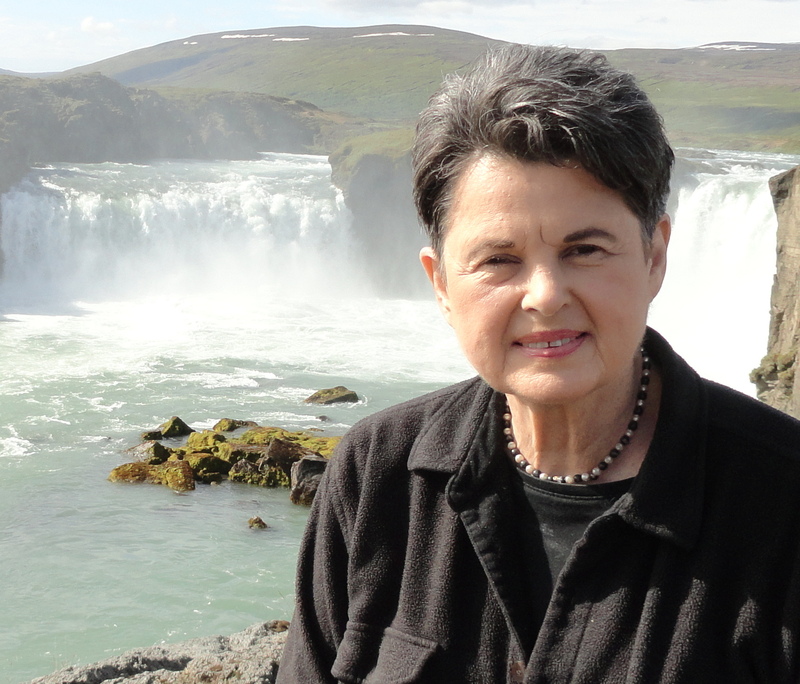 And while all of this action was going on non-stop, the air still penetrated of rotten eggs and none of the mud pots had claimed a tourist from our Tauck World Discovery tour that we could see. 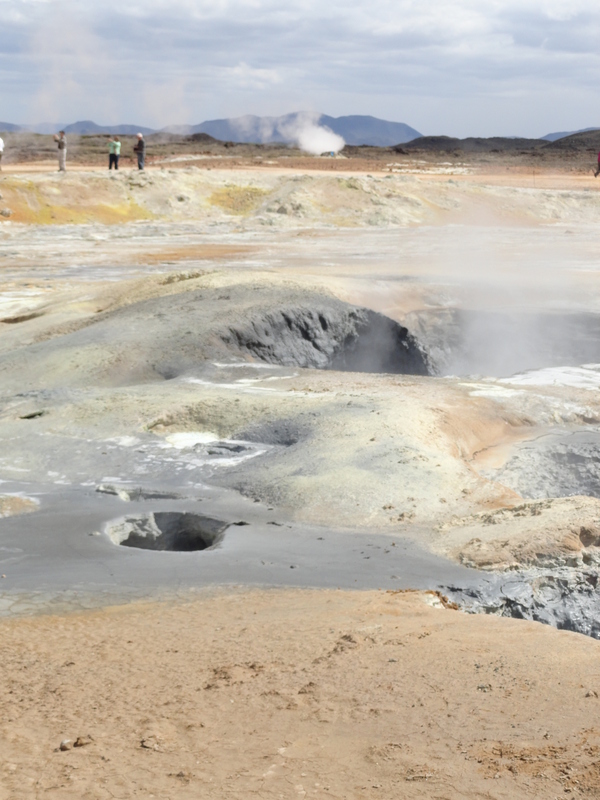 All of the tourists made it back to the bus safe and sound from the boiling mud pots, steam pots and frying egg sizzling sounds after experiencing Iceland’s land of fire. 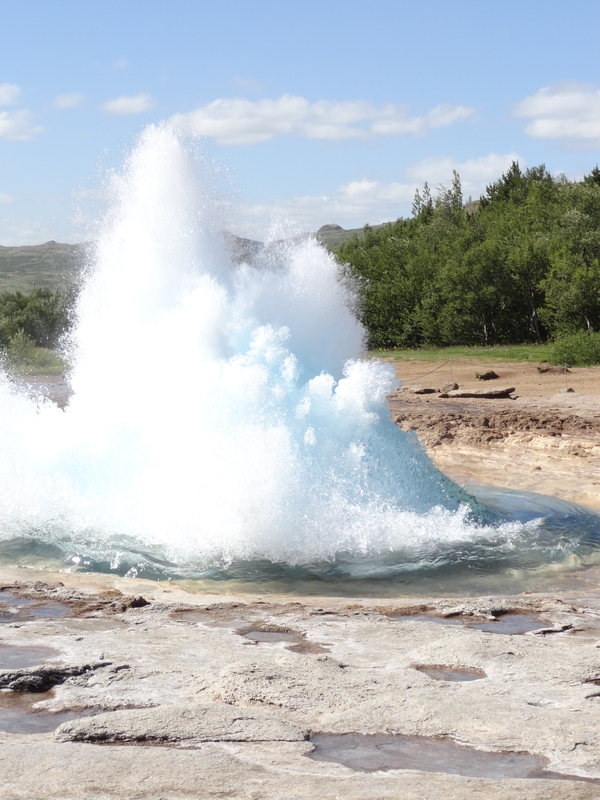 And the rotten egg air now penetrated inside the bus for all of us to experience as we drove away seeing a huge geyser shooting 50 feet straight in the air and then to see Gullfoss Waterfalls and another volcano ready to erupt anytime. 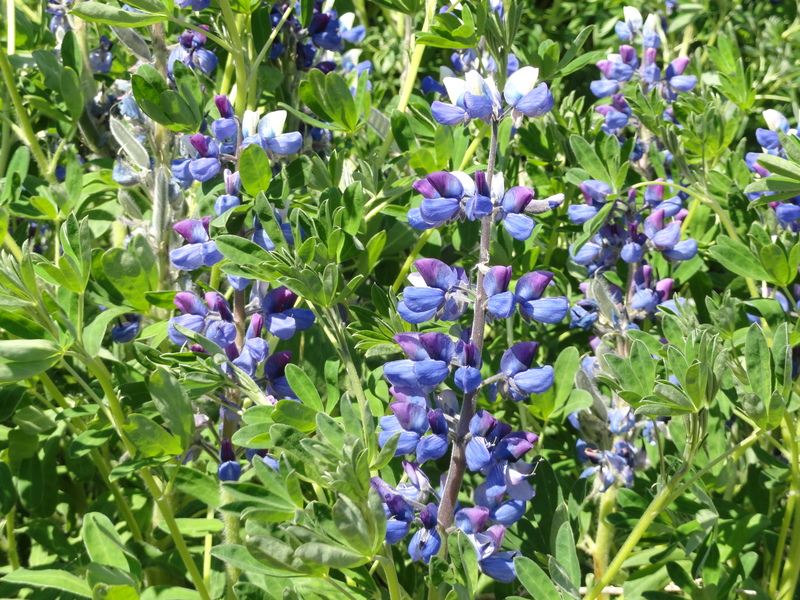 And among all this fire and ice only in the glaciers, everything in Iceland is green with postcard quality scenery and 2-foot tall Alaskan Lupines, which look just like those Texas Bluebonnets only bigger and taller.